Wind energy has been harnessed by the oldest of civilizations. Today, the wind energy sector has evolved to generate electricity, through wind turbines taking off a major load from conventional sources of energy. Wind turbines use the power of natural wind to generate electricity. The technology is still in its nascent stage. It must overcome technical, economic and political challenges for commercial and large-scale deployment. Several developing countries have opened up a plethora of opportunities for the global offshore wind turbines market as the pressure of keeping the carbon emissions low is mounting each day. According to the research report, the global offshore wind turbines market is projected to be worth US$58,729.7 mn by the end of 2025 from US$29,418.9 mn in 2016. During the forecast period of 2017 and 2025, analysts estimate that the global market will surge at a CAGR of 7.7%. As shallow- and deep-water spots being explored harness the potential for power generation from wind, they are likely to augment the growth of the floating wind turbines segment over the forecast period. Offshore floating turbines are advantageous over fixed structures in terms of the total cost incurred in installation and production. These wind turbines come with a floating platform to support the entire turbine structure. On the other hand, traditional offshore plants need fixing of foundations to the seafloor and bolting of massive turbines on them, which can hamper the ecology as well. Several new, offshore, floating wind turbine projects are in the prototype phase for testing of their operational feasibility, particularly in India, China, South Korea, the Pacific Islands, and Japan. A floating platform and its turbine are entirely manufactured onshore. They are then towed out and tethered to the seafloor. Another advantage of the floating platform is that they can be identical in shape, which reduces the cost of customization. 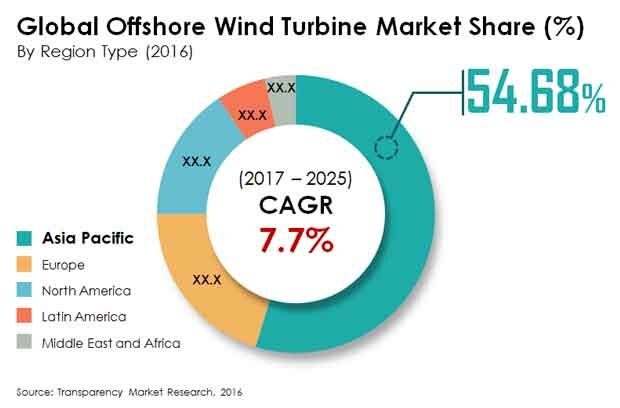 From a geographic point of view, Europe and Asia Pacific are expected to provide significant growth potential for the offshore wind turbines market during the forecast period. Europe dominated the global offshore wind turbines market in 2016, with vast expansion in offshore wind power generation. Wind is one of the leading sources of the renewable energy mix in the region. Offshore wind energy is gaining market share at a rapid pace in the renewable energy mix because of the advantages that it possesses over onshore wind energy. Various countries across the globe have established electricity generation targets from renewable energy. Developing economies such as India are now focusing on renewable sources of energy for power generation. India has set targets of electricity generations by wind energy and solar energy. Exploration of offshore sites is being carried out in order to enhance profitability of power generation from wind. Unlike onshore sites, offshore sites generally have uninterrupted winds throughout the year. Some of the key players operating in the global offshore wind turbines market are Enercon GmbH, Siemens Wind Power, Gamesa Corporacion Technologica S.A., Guodian United Power Technology Company Ltd, Nordex S.E., Vestas Wind Systems A/S, Upwind Solutions Inc., Suzlon Group, Xinjiang Goldwind Science & Technologies Co. Ltd, and GE Wind Energy. The offshore wind turbines technologically advanced, and include a number of engineering and mechanical innovations to help maximize efficiency and increase the production of electricity. The energy produced from turbines in deep waters in the North Sea alone could meet the EU’s electricity consumption four times over. Deep offshore designs are competitive in terms of the levelised cost of energy (LCOE) with bottom fixed foundations in more than 5Om water depth. Wind energy has been utilized by humans for more than two thousand years. For example, windmills were often used by farmers and ranchers for pumping water or grinding grain. In modern times, wind energy is mainly used to generate electricity, primarily through the use of wind turbines. Developing economies such as India are now focusing on renewable sources of energy for power generation. India has set targets of electricity generations by wind energy and solar energy. Exploration of offshore sites is being carried out in order to enhance profitability of power generation from wind. Unlike onshore sites, offshore sites generally have uninterrupted winds throughout the year.